The Mt. 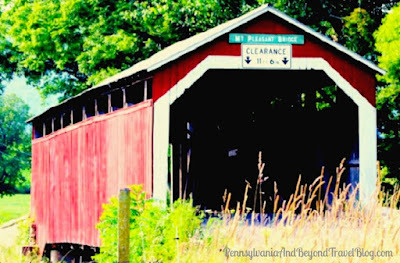 Pleasant Covered Bridge is located in Perry County, Pennsylvania. I grew up in Perry County and I'm familiar with 4-5 of the covered bridges located there. When I was a child, my brother and I would "lift our feet up" every time we crossed a bridge in our family's car. It was sort of a game that we all played, excluding the driver of the car. If one of us would forget to lift our feet up during the bridge crossing, the other one had to take the trash out for a week. Oh...those silly games we played as children. Built in 1918 by L.M. Wentzel , the King post bridge crosses Sherman's Creek and measures approximately 60 feet long. According to the sign located at each entrance, the clearance is 11 feet 6 inches. The wooden bridge is painted in your traditional red color with white trim. It is owned and maintained by Perry County. You'll find it located on Twp. Route 304, Mt. Pleasant Road, just south of the State Route 274 in Mt. Pleasant, Jackson Twp. The bridge is open to traffic and is mainly used by the locals. If you're a fan of the Amish, there are local Amish farms nearby, and you may get lucky seeing a horse and buggy passing through the covered bridge. When visiting Perry County to see the various covered bridge, I recommend going during the fall season when the fall foliage is at its peak. It will make for some great photographs and you'll be treated to some nice fall foliage while traveling on these back roads and passing through some of the smaller towns located throughout Perry County.